This week we are off on our travels again. I feel like I'm becoming a bit of a pro when it comes to travelling with kids! Here are a few of my favourite summer travel products for toddlers and preschoolers. The Totseat is an all time favourite in our household. It is a washable, squashable highchair that fits in your changing bag and is ideal for when you are going to be eating out at restaurants or staying in accommodation where there may not be a fixed highchair available. The Traykit from Content and Calm is part backpack, part tray. It is perfect for use on long plane, train or car journeys as it folds out further than a traditional tray to create a place for your child to play or eat from. We've tried other kids suitcases but nothing quite comes close to the Trunki. Both of our girls will be taking their Trunki suitcases with them this summer. It gives them a sense of ownership and they are great for sitting on while Mum and Dad drag them through hotel lobbies and airport lounges! When you're travelling, the last thing you want is a leaky drinks bottle in your bag but during summer holidays it is important to keep the kids hydrated. While we are travelling by car this summer we are going to take Lara's Contigo Kids drinks bottles because they are leak-proof so won't spill everywhere over the back seat! My favourite buggy shade, the Snoozeshade Plus - I won't go on holiday without it! This lightweight buggy and pushchair cover keeps baby out of the sun with high UPF protection and also helps to provide a shady place for them to fall asleep when you're on the move. Very easy to fit and to remove when you want to reach into the buggy. 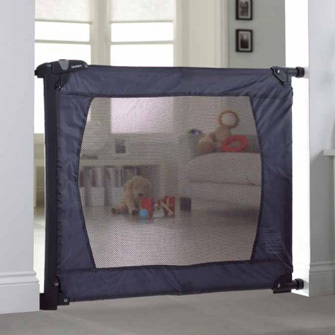 Our Lindam Flexiguard was originally bought as a spare for the Grandparents house but it folds up so compact that it is ideal for us to put in the car and take with us on holiday. As a travel stair gate it works well to block off access to undesirable parts of a hotel room or holiday let. I will admit that the Baby Banz sunglasses weren't a great hit with Lara who used to always pull them off instantly. But Holly seems to tolerate them for a lot longer and it is comforting to know that her eyes are protected from the sun when on holiday. 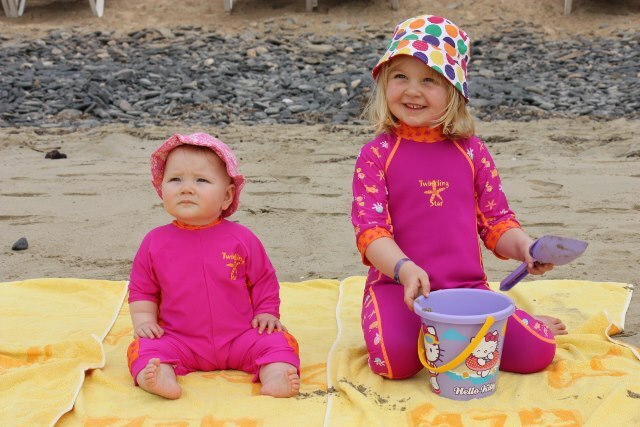 We bought our girls matching Splash About UV sun protection suits for our winter holiday to provide high UV protection across their bodies in the sun when they were splashing by the pool or the beach. 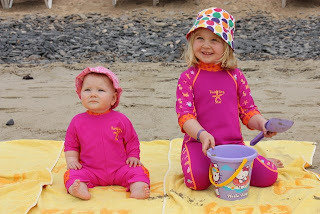 Splash About sell suits suitable for babies and children and they are stretchy and easy to put on. The Cot Canopy Breeze is a versatile shade which covers an entire cot, cotbed or travel cot. 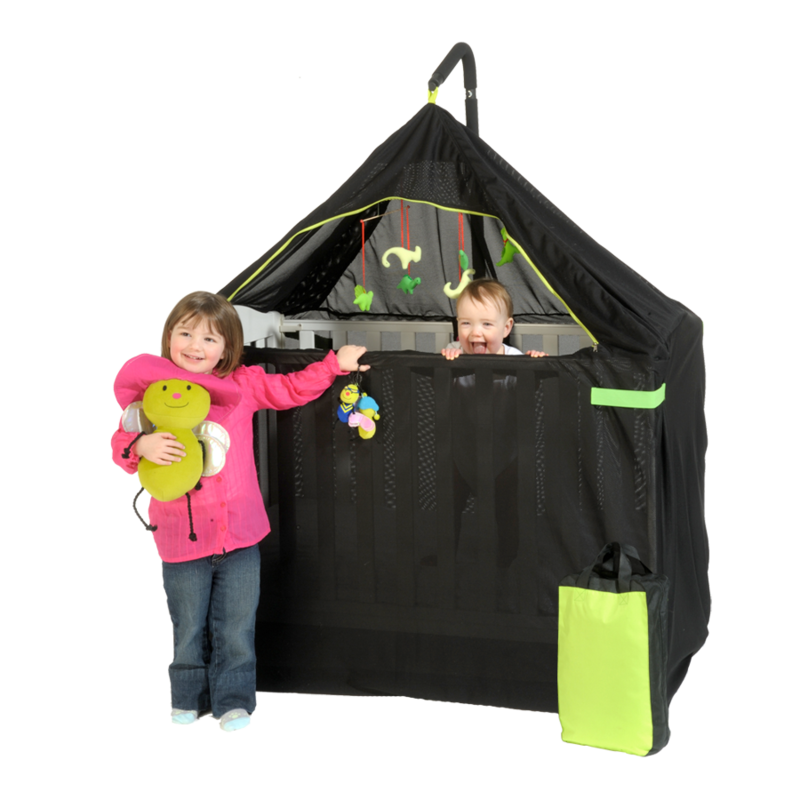 For us it is ideal for taking on a sunny holiday because it can provide shade and darkness for our baby girl at a time in the evening when our holiday bedroom would otherwise be bright. It is tall enough that Holly can still stand up in it (with a very cool teepee type hanging mechanism) and has quick access if we need to attend to her during the night. The Dream Tubes bed guard are so compact that I don't mind fitting them into the luggage just in case we need them. 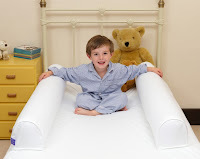 They comprise a fitted bed sheet with two inflatable tubes which act as a natural bed rail on both sides. This is great for children who may still roll out of bed when they are in an unfamiliar location. Other things we are planning on taking with us include the Flexibath folding baby bath, a Kiddicare travel cot and a set of mOmma plastic spoons and forks. What are your top travel items for holidays with young children?